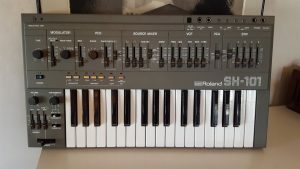 “The classic Roland SH-101 in great shape. Sounds fantastic. Cosmetically, this synth is in very good condition. Minimal wear, but some from normal use. Overall, cleaner than most you’ll find. It is missing one fader cap from the envelope section. Check out the photos. Functionally, the synth is in good shape, but there are two (common) issues that I have encountered. First, the ever so common dirty power switch. If this is bumped, the oscillator pitch fluctuates slightly.